Oh, reading in March has been delightful, deep and at times challenging. It has been a little bit of light-hearted fiction, along with some encouragement and some admonition to consider the truth in “all is grace.’ It really is fantastic how a good story can get a mind thinking, bring direction to a life, and minister to a heart. I hope that you have experienced some of that this month! I just realized that I don’t have any photos of the books I actually read this month. The photo above, that I took in February, was of a stack of books I thought I would read in March. But that only partly happened. Only a couple of these books were read. Others were returned to the library, as renewals were not available. Those library fines sneak up on me too often! Money Saving Mom by Crystal Paine. This is an Extremely encouraging book with many tips and examples for building a business and for making a difference in this world, close to home, and around the world. I think this is Crystal’s best book yet. Little Beach Street Bakery by Jenny Colgan. A fun piece of fiction was refreshing this month. It was delightful to take an imaginary trip to a Cornish island and enjoy the salt spray with fragrance of freshly baked bread. This book is a little outside what I normally read and I did find it a little racy and the language colorful, but I did enjoy the story of loss and finding a new and better way. This book, Choosing Him All Over Again, is a wonderful breath of fresh air in my literary journey this month. I was offered the audio book free in exchange for my review on audible, and I’m so thankful that I accepted. This is the story of Juana Mikels, how her early marriage nearly failed due to a lot of wrong thinking and messages about what makes marriage last, and how, through a new relationship with Christ, her marriage was saved. All, indeed is grace. And that grace is not to be taken lightly. I appreciate this story. It is an echo of my own story, and of the story of my original family. So often we hear from and read of the saints who, by grace alone, have attained a cleaner, less broken road. It is spirit refreshing to hear form others, who stumble greatly over the road less traveled, yet continue to cling to the grace of Jesus. All is grace. Dear Mr Knightly by Katherine Reay, audiobook. During spring break some of took an unplanned road trip to visit my father. He is living with COPD and took a downturn earlier this month. Dear Mr Knightly is a wonderful story, maybe my favorite contemporary book, and sure helped those 500 miles pass by more enjoyably. Driving isn’t my favorite activity and it seems the older I get, the harder it is to keep my eyes focused because my mind wanders so. Audiobooks help a lot! Joyness, my grand-daughter is now 3 years old, and reading together has become a richer, more delightful time. She has favorites from the family bookshelf: “Wake Up Grizzly”, “The Big Green Pocketbook”, “The Hungry Caterpillar” and a Bible storybook. Even though she has those favorites, and we read them over and over again, Joyness is quite open to exploring new stories from the library. This month we found a winner, one that might be purchased for her own bookshelf, and one that we are happy to turn back to the library. 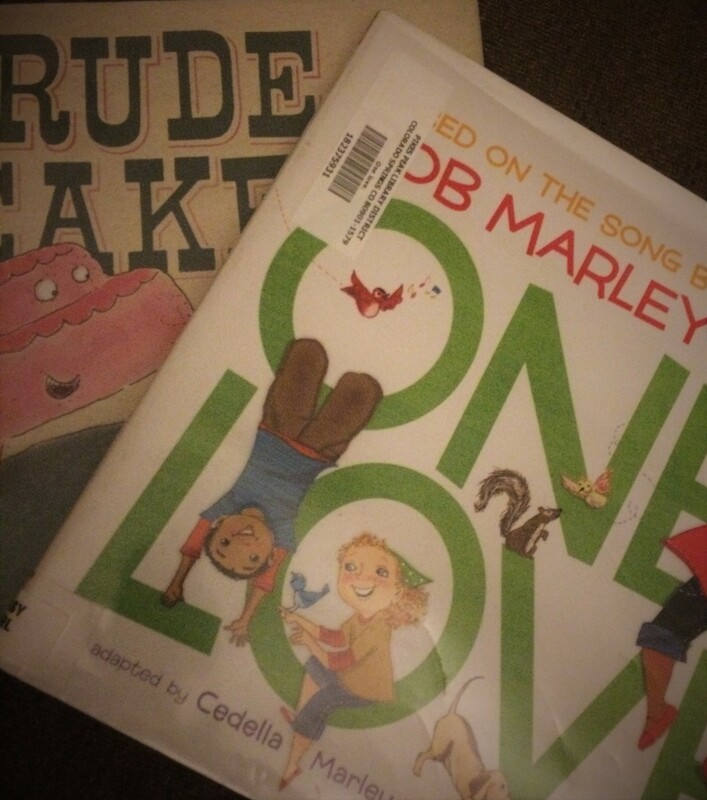 One Love, Based on the Song by Bob Marley, adapted by Cedelia Marley This is a wonderful picture book. The writing is simple, and is based on the Bob Marley song by the same name. The illustrations are fabulous! Joyness and I had so much fun looking at all the children and talking about them. Rude Cakes by Rowboat Watkins. Two thumbs down. I didn’t enjoy the story, Joyness didn’t understand it at all. And Cyclops? hmmm. That is just our opinion. I noticed on goodreads that there are plenty of people who have different thoughts about Rude Cakes. So, check it out and tell me what YOU think. Well, that’s pretty much what I’ve been reading this month. Thank goodness for audiobooks or this list would be very short! 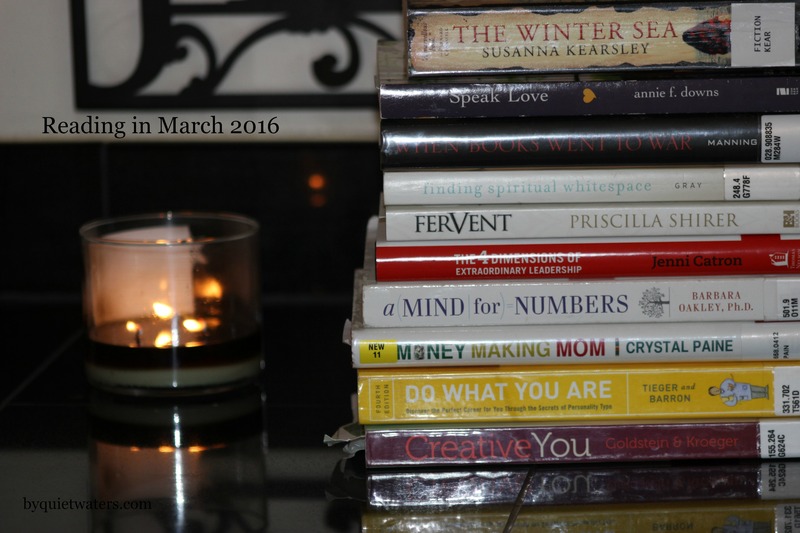 As the month wraps up, I am linking this Reading in March post with Jessica over at Life as Mom. Goodness, I do hope to get more paper and ink reading done in April. What have you been reading in March? If you have any recommendations for me, please tell me in the comments!